When you really love something, you learn which parts of it to ignore. If you are wise, you focus on the good and turn away from the bad. But I wonder how many people mutter, “Yeah, right!” when they read a recipe that instructs them to peel and seed fresh tomatoes before proceeding. Especially in high summer, why add a step that requires you to stand over a pot of boiling water? When I was young and inexperienced in the kitchen, I didn’t peel or seed tomatoes. Summer tomatoes are incredible. They're a peak life experience, I rationalized, so why reject any part of them? In my youth I could not appreciate the smooth elegance a ripe tomato achieves when it is freed from its legions of seeds and thin-but-tough skin. But nuance, I now see, is everything. It all makes sense when you remember that tomatoes are fruit. The exterior skins provide necessary barriers to the juicy, yielding interiors. When cooked in a sauce, this same protective quality makes tomato skins turn the texture of plastic wrap. Under simmering heat, the skins curl away from the tomatoes and float to the surface like debris. Worse, tomato skins in sauces are an unpleasant distraction from the main event, which is sweet, acidic flesh simmered with aromatic herbs, garlic, and onion. As for tomato seeds, they bother some people but not others. True, they taste a little green and sharp, and they don’t give under the tooth. Purists object to both the taste and appearance of the seeds. I don’t mind the way the seeds taste or look. To my mind, the real benefit of seeding tomatoes is to get rid of the watery liquid found inside the tomato’s chambers. Excess liquid has to be cooked away. You don’t want to cook a fresh tomato sauce for long; too much simmer time will age it, turning its otherwise sweet flavor into something old and canned-tasting. Watery tomatoes also make grain or pasta salads soggy and gummy, especially if they sit awhile before being served. 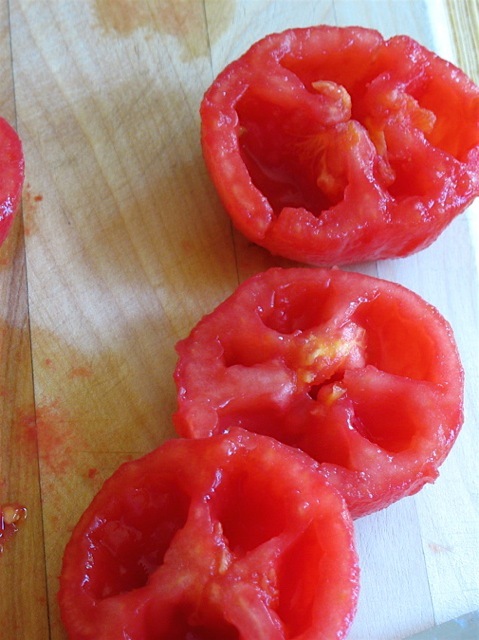 Here’s how to remove tomato skins and seeds, leaving you with nothing but perfect flesh. Put on a pot of water to boil. Fill a large bowl with ice water. With a paring knife, cut a tiny "x" in the bottom of each tomato. Drop the tomatoes into the boiling water. Count to 10. 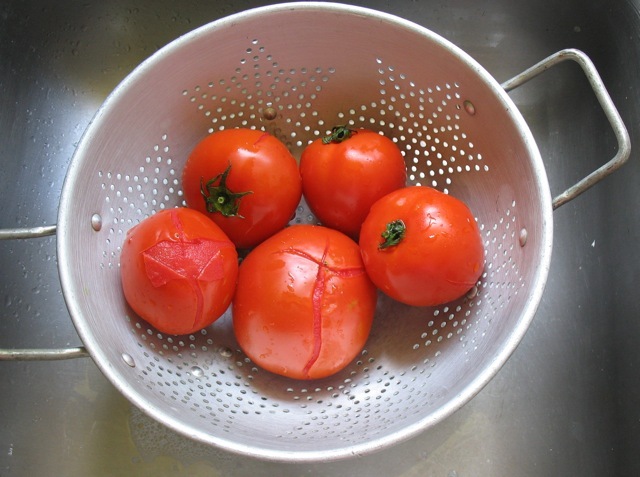 Remove one tomato with a slotted spoon and pull on the skin to see if it is loosening. (You may even see bits of skin curling away from the tomato.) If the skin is still tight, put the tomato back in the pot and boil for another 10 seconds or so. If the skin is loose, immediately remove all the tomatoes from the pot and plunge them into the bowl of ice water to stop the cooking. Once the tomatoes are cool, immediately take them out of the water to drain. Leaving exposed tomatoes in water may cause them to become waterlogged. With a paring knife, remove the skins and cores from the tomato. Cut each tomato in half around its equator. Set up a bowl with a sieve across it to catch the seeds. Take a tomato half in one hand and gently squeeze it over the sieve to expel the seeds and the clear liquid around them. If the tomato is so ripe that squeezing it makes the flesh break down, swab out the seeds with your finger instead. You may also need to use this alternate method if you are seeding a very large tomato, such as a beefsteak. Save the accumulated juices. You may want to add them back to the sauce you are making, or use them in a chilled soup or cocktail. Proceed with your recipe, dicing or chopping the remaining jewel-like tomato flesh. It's the pure, sweet taste of summer.